The end of an election cycle shaped by corporate cash is apt timing for a book that argues that the dominant color in U.S. politics is neither red nor blue but "puke green." Taibbi, the Rolling Stone writer who likened Goldman Sachs to "a great vampire squid wrapped around the face of humanity," explains how America has become "a paradise for high-class thieves." Captains of industry and Wall Street wizards--abetted by their "slavish [lapdogs]" on Capitol Hill and a feckless press corps--levered lobbying clout, their mastery of legal loopholes and pithy sound bites to hijack the political process and con middle-class voters into backing policies that favor the rich. Taibbi identifies the godmother of that "grifter class" as objectivist philosopher Ayn Rand, whose disciple Alan Greenspan, the former Fed chairman, championed the deregulation that ushered in a succession of elegant scams. 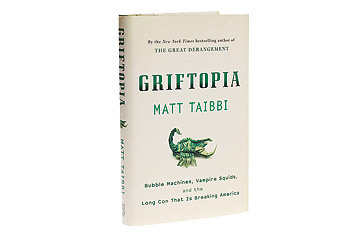 From the mortgage crisis to health care reform, Taibbi chronicles the corruption of the political process with indignation and dark humor. The takeaway? Be angry, but blame the right culprits.